Elementary school students can experience the joys of climbing with this enticing playground set from Kidstuff Playsystems. With tons of activities to choose from, there is always something new to explore, and plenty of space for the whole class to play together. 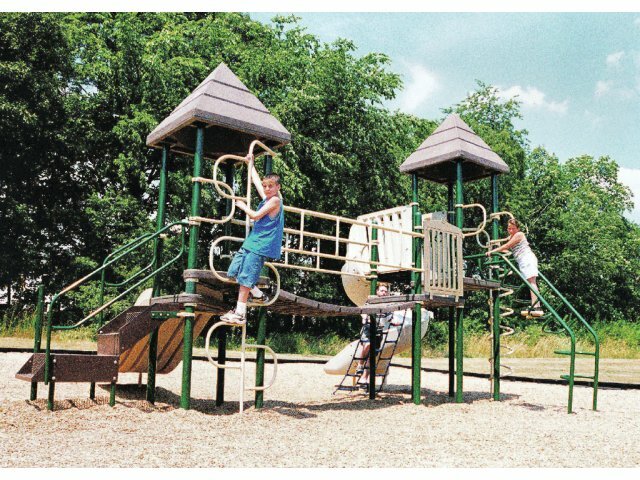 This playground set includes a Coil Climber, Loop Arch Climber, Snake Climber and vinyl-coated chain net, so you never have to go up and down the same way. Slides and the popular Clatter Bridge add to the fun. With so many cool things to do, kids can enjoy being active outside for hours. The shaded, rotation-molded platforms keep children cool as they play, and ensure many years of enjoyment. Encourage motor skill development, social interaction, coordination, creativity and more, all with one exciting playground set. Fun Fitness: Includes a Coil Climber, Loop Arch Climber, Snake Climber, vinyl-coated chain net, slides and a Clatter Bridge. Shady Play: A roof over the two main platforms keeps kids cool, even when it’s sunny out.